Brian O’Reilly has claimed the highly-contested Irish PGA Assistants’ Championship trophy played at Nuremore Hotel and Country Club. Brian O’Reilly, who is assistant pro golfer at Glenlo Abbey, started the final round with a two-shot lead, and despite deteriorating conditions, he ground out a 76 to collect the trophy. The 25-year-old's four-round total of 289 (+5 ) gave him a three-shot margin of victory over Stephen Barry (Royal Tara GC ), who led after 36 holes, Brian McCormack jnr (Royal Dublin ) and Paul O'Neill (Shannon GC ), who fired a brilliant final round 69. He thought his third round72 (+1 ) "wasn't too bad" and might be good enough to put him in the lead. “I missed a short putt on nine, but I responded well with birdies at 10,11,12 and 13 to get into a nice position. I had a couple of other chances coming in, but also threw in a couple of bogeys,”he says. He remained steady over the opening nine holes of the final round, but then dropped shots at the 10th and 16th before losing a ball on the 17, which cost him a double-bogey. 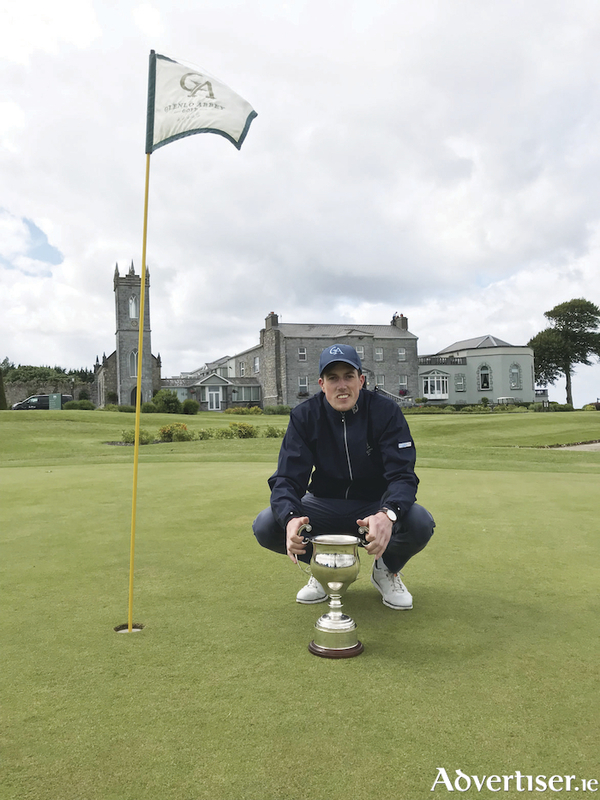 Glenlo Abbey general manager Colin Brown was thrilled O'Reilly followed in the footsteps of David Feherty, Neil Manchip, Damien Mooney, Brendan McGovern, and recent European Tour winners Damien McGrane and Simon Thornton. Bearna Golf Club: Lady Captain’s Prize to Men, James McGovern (20 ) 40 (back 9 ); Reamonn O Laighin (23 ) 40; Gross, Patrick Neville (1 ) 34; John Connolly (17 ) 38; Class 1 Kevin Mcnamara (5 ) 36 ; Class 2 Sean Smith (16 ) 38; Class 3 Padraig Cuddihy (26 ) 36; Front Nine Stephen Connelly 20; Back Nine Donal Geraghty 21. Ladies, Edel O’Donnell (36 ) 39; Margaret O’Donovan (24 ) 39; Gillian Trainor (32 ) 38. Galway Bay Golf Club: Lady Captain’s Prize Eileen Clasby 2018, Catriona O’Regan (26 ) 104; Jacinta Quinn (26 ) 106; Gross, Helen O’Flaherty (11 ) 128; Deirdre Toohey (18 ) 108; Katherine Cahill (22 ) 109; Eilisa Molloy (17 ) 110.5; Front nine, Emily Stanley; Back nine, Miriam Jordan; Nearest pin, Orla Shields, Longest drive, Fiona O’Driscoll; Cat 1, Sharon Rooney, Cat 2, Nano Gough, Cat 3, Aileen Sheehan, Past captains, Sheila Lawlor. Athenry Captain’s Prize: Graeme Reidy (12 ) 97; Declan Mullally (11 ) 98.5; Gross, Darren Joyce (6 ) 112; Michael Hogan (19 ) 104.5; Adrian Pilkington (14 ) 104; 2nd gross, Michael Kennelly (0 ) 112; Bob Reilly (7 ) 105.5; Jim Cloonan jnr (10 ) 106; Richard Monaghan (13 ) 106.5; Oisin O’Connell (0 ) 106.5; Past capt, Michael Mulryan (17 ) 110.5; Best qualifier, Joe Barrett (24 ) 114; Nearest Pin, Keith Lally; Ladies Prize: Eilish O’Flynn (37 ) 69; Longest drive, Mark Moran.